Need a little inspiration this Friday? Here’s one of my favorite recent musical discoveries. This lush and evocative four-song EP is dreamy, spooky, cinematic and quiet — exactly all of my favorite elements this summer. There are contradictions in Alex Krug‘s voice: The softness with which she sings belies her power, the prettiness of her vocal is offset by a rawness that appears and disappears to devastating effect. And each song on the Alex Krug Combo’s new EP, Gentle Spotted Giants, is delivered with absolute care, even as its wrung from the singer’s guts. Lead track “Divers” begins with snare rolls (guest artist Bill Berg) and the quiet thunder of upright bass (Kevin Lampson). The song moves unhurried — a few notes plucked from the violin, a strum of guitar. An electric guitar (Kyle Samples) revs in the background, fuzzy and ominous as an approaching storm. All the while, Krug’s strange and wonderful vocal dips and swells into the song. Each instrument adds texture, and the track builds like a fantastical tale without ever losing sight of its own emotional thread. “Towhee” is slower, more rocked by ion-rich gusts, haunted by gathering shadows. Rachel Gramig provides warm and resonant harmonies to Krug’s lilting melody. “I hit the rocks, on the edge of water / I’ve been beat up, can’t hold it together,” she sings. The songs pauses just briefly, breathlessly, and then the boom of two drum beats brings the music back in. Lyndsay Pruett‘s violin is so lovely it stings to listen, and when Krug hits her upper register — just for a few measures — the effect all updraft and velocity and terrible beauty. “Whaleshark,” the EP’s longest track, was produced by Michael Selverne/Welcome to Mars. If the rest of the EP is deliberate and expansive, this song positively breathes in space. Strings waver between gorgeous and damaged territories. Each note is mined for its most and least dulcet tones; instruments cry and echo, otherworldly and animalian. Krug’s and Gramig’s voices weave and part, gliding in a couple’s dance over the textural soundscape of percussion and electric guitar. A story unfolds, but so does a sonic atlas — a journey informed as much by instrumental explorations as by narrative. It’s shattering and still uplifting, if just for its sheer beauty. Final track “Sail With You” is perhaps the sweetest offering. It carries on the oceanic theme, and so too the vastness and loneliness of that metaphor. But here Krug’s voice is close and clear. “Maybe I could sail with you / cut across these waves with you,” she sings. It’s airy and untethered, the thrumming low notes of the strings like the call of a ship lost in the fog. Every part of the song aches in the way that, say, an Irish folk song reverberates with loss and longing carried for generations and held captive in a few potent verses. 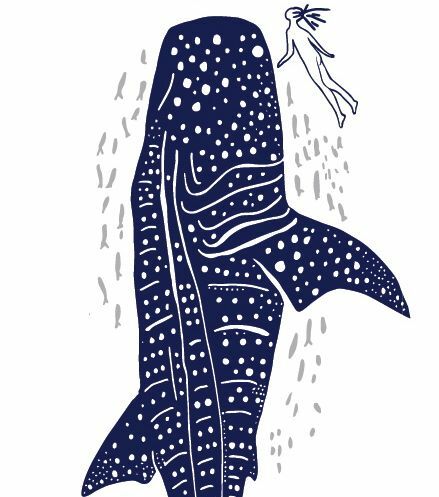 But as much as “Sail with You” feels timeless, it’s also distinctly present — a love song for the love of singing, for the whaleshark or for the gentle spotted giants after whom the album is named. Or for the ocean itself. Romantic as the track is, the “you” ultimately matters little while the song itself looms large long after its final notes.